A few weeks ago, I decided to shoot out to the end of the Peninsula for a little bit of a splash around in the shallows. I was armed with my new Seac Combat 95 Speargun, so I was expecting maybe to see something worth keeping! Amazed to find a good few Snapper and provide enough of a feed for the whole family AND the neighbors! 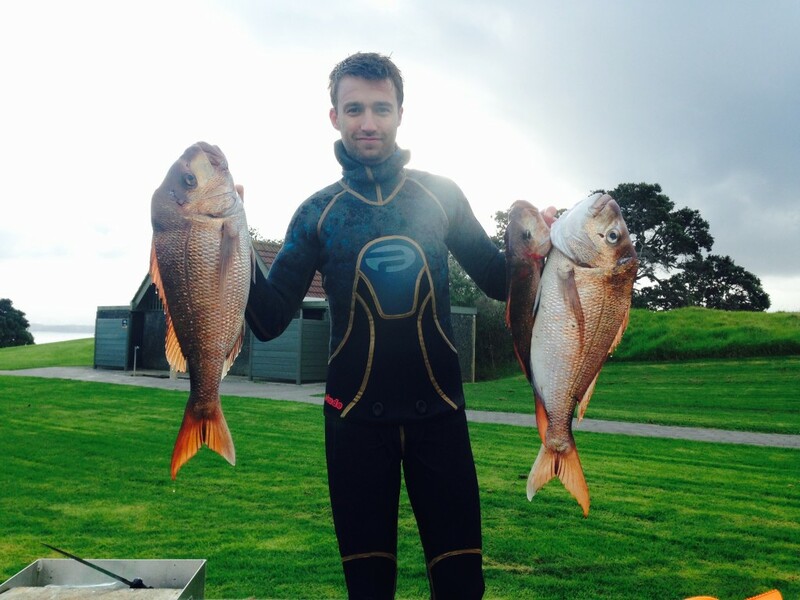 Spearfishing can still be great in Winter (if you can brave the cold) and you can get some great eating fish. Using smashed up Kina is excellent to bring them in, but you definitely have to be quiet and approach slowly, possibly from cover if you can, to get the upper hand on these crafty blighters! These beauties where caught in no more than 5m of water, so you don’t have to be an expert at free diving to catch some for yourself. However a good basis of knowledge for breath hold and safety can go a long way. A couple of excellent specimen with a smaller ‘pan’ size fish made for excellent eating!